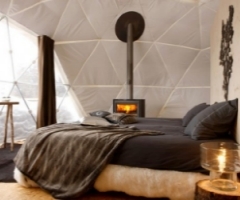 Pitched at an altitude of 4600 feet, the award winning Whitepod camp consists of nine pods (dome shaped tents) and a main lodge. Access to the camp is on foot or skis. Choose between one of three pods: the Expedition Pod, the Pavilion Pod and the Group Pod. Each pod serves as a bedroom, designed for double or single occupancy (except the Group Pod which sleeps up to eight guests). Heated by a wood burning stove and insulated with the latest technology, they are wonderfully warm day and night. Wake up to a majestic Alpine panorama... immersed in nature, discover and appreciate the beauty of the Alps from the comfort of your own pod. Fall asleep in the soft glow of oil lamps, snuggled under organic bedding and sheep skin throws - experience the physical and spiritual well-being that Whitepod seeks to nurture. The main lodge, beautifully refurbished using local materials, houses the dining room, the lounge and the spa. Enjoy casual dining around the fireplace or, weather permitting, on the terrace overlooking the gardens and the campfire. The spa on the lower ground floor features showers and a sauna. Located in the heart of the Swiss Alps, the Whitepod resort is inspired by a desire to create a haven of beauty and tranquillity for those seeking to restore tired bodies and jaded spirits. No busy streets. No crowds. No noisy bars. Nothing but the majesty of the Alps, the breathtaking beauty of the scenery and the silence of unspoilt nature. The result is an exclusive destination with two choices. 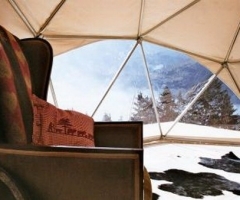 The solitude of the Whitepod eco camp, for a maximum of 24 guests at any one time. 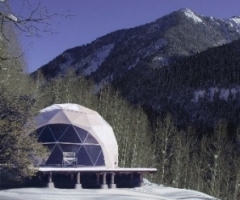 Or climb higher into the mountains to the Whitepod refuge, standing on the edge of our private ski resort. Discover traditional food prepared by resident chefs... experience numerous activities catering for any inspiration, relax with a deep tissue massage and a sauna at the end of an active day. Above all, look forward to being immersed in pristine nature - utterly still, unbelievably beautiful.